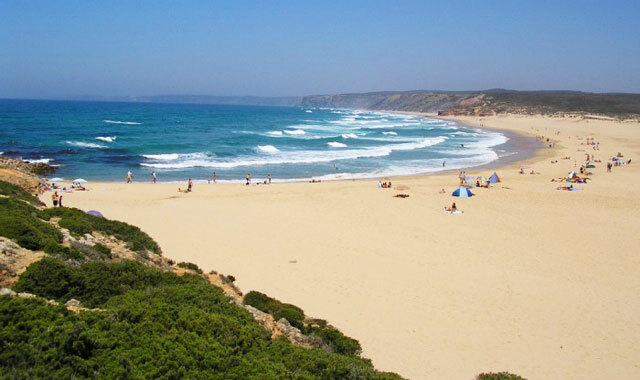 This beach is on the west coast of the Algarve and can be reached by traveling north from Vila do Bispo, then after passing the small village of Carrapateira turn seaward where there is a sign that reads "Praia". Virtually a long sandy beach with many sand dunes and very often virtually deserted out of the season. Enjoy the feeling of being open to nature and exploring the surrounding area on foot. At Bordeira beach, the black shale is interrupted to give place to a limestone cliff of light and warm colors, opening possibilities for the diversification of the vegetation. On the beach, the sand dunes advance inland to the town of Carrapateira and around Bordeira river, that occasionally results in the formation of a lagoon of warm waters near the river mouth and where it's still possible to see otters. Also worth of mention are the pine dunes with huge and ancient pine trees, some being used as agricultural sheds due to the diameter of its crown. The beach is vast, with more than 3Km long exposed to sea winds, and extends to Pedra de Matez, a huge rock of red tones to the North. The cliffs of Bordeira are famous for their fishing spots, almost inaccessible and highly sought after by many seabirds that find shelter here. Access: There is a road starting at the northern entrance to Carrapateira and leading to the beach, roughly two and a half kilometres away. It starts out as a tarmac road, but it ends in a dirt track. Parking is not organised and there are no support facilities, but the beach is supervised during the bathing season. The beach faces North-West/North.